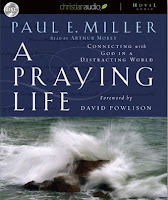 In A Praying Life, Paul Miller writes about how important prayer is to the Christian life and about learning to pray in the midst of the distractions and troubles of everyday life. I really appreciated how honest this book was. He didn’t come across as someone who thinks they have it all together when it comes to prayer, instead he comes across as a fellow learner. The book is heavily illustrated with examples from the authors own life, particularly his struggles in parenting a disabled daughter. These examples help the book not just to be good theory on prayer but practical help too. I “read” the book in audiobook format. Although the recording quality was a little uneven in patches it was a pleasant listen. The book has a lot of good things to say so I wouldn’t recommend reading it through quickly. It would probably be better to just read one chapter at a time and stop to think and pray about what you had read. Since reading this book I have found myself praying more. I recommend it. Review copy provided by christianaudio reviewers program.